Fly to the ruff-ruff rescue with the exclusive Paw Patrol Mission Paw Air Patroller! The Mission Paw Air Patroller transforms from hover (helicopter) mode by rotating the propellers into plane mode. For added adventure, the Air Patroller features lights and sounds that accompany you on all your Air Rescue missions. You can fit up to 2 characters in the cockpit and 4 in the cargo bay. 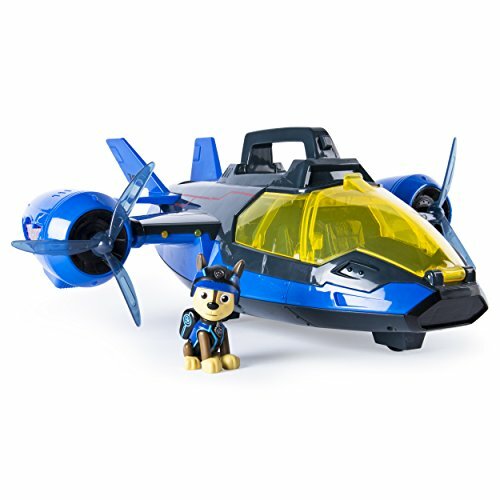 Includes a Chase figure to save the day, and when the mission is complete, you can bring the Mission Paw Air Patroller in for a landing with its real working wheels or transform to helicopter mode and hover down for a perfect pooch landing atop the Paw Patroller (sold separately). Bring home the air rescue adventures of Adventure Bay with the Mission Paw Air Patroller!